These blooming tea flowers turn tea time into a mesmerizing ritual. The blossoms open slowly inside the glass pot, and they’re infused with Chinese tea that delivers delicious fragrance and flavor. Each flower is good for about three infusions. 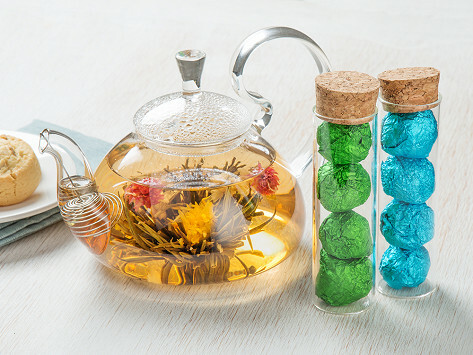 This set includes a beautiful glass teapot with a wire filter plus eight beautifully wrapped blooming teas. Dimensions: Teapot: 6.8" x 6.8" x 6.5"; Tea Bloom Set: 1.8" x 1.8" x 6.5"
Weight: Teapot: 1.05 lbs. ; Tea Bloom Set: 0.23 lb. 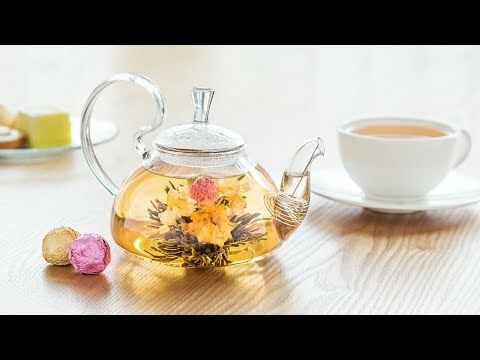 I love this teapot and flower tea! It is so relaxing and helps warm up days of dismal weather. Always makes me smile. It was a birthday gift to my Daughter in law and she loved it! Thanks!